Crossbreed Holsters Review - Are They Good For Concealed Carry? 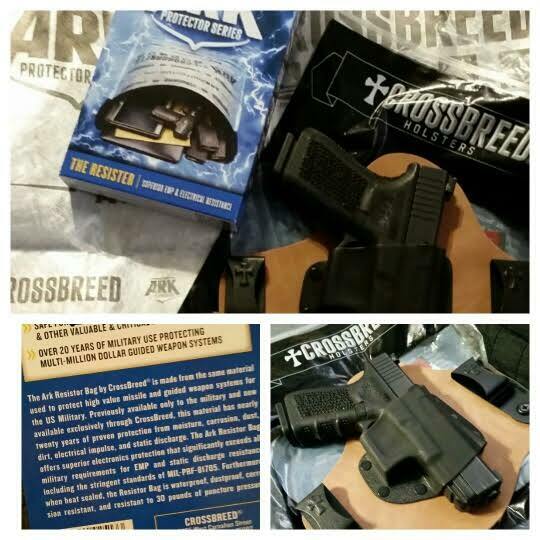 Blog Are Crossbreed Holsters Good For Concealed Carry? “The quality of decision is like the well-timed swoop of a falcon which enables it to strike and destroy its victim. (defense rests solely on the timing of the individuals involved,) Therefore the good fighter will be terrible in his onset, and prompt in his decision.” Sun Tzu for the modern man. Anyone with an electric oven and a few bucks can make holsters these days. There is, of course, a difference in holsters made to last, and those made for looks. As someone who carries concealed daily; and has for over two decades, there is a difference in manufacturers. Some manufacturers build holsters for looks, they will match the specialty painted 1911 or other artistic looking handgun. And then, there are the holsters for users. Now, understand this, I absolutely believe you can have form/beauty and function. However, I also have seen far too much sacrificing of function for form recently. CrossBreed® has well over a decade of history and solid craftsmen-ship behind their products. I do not generally get my belts from them, nor do I carry ankle rigs or shoulder holsters, long ago realized that the uncomfortable nature of carrying was not offset in any beneficial way. However, I have owned and will continue to own and regularly use their wonderful Leather and Kydex CCW and OWB rigs! When not carrying where I needed level III retention their standard super tuck rig absolutely fits the bill. When I needed more retention for whichever group I was working with at the moment, I would choose a holster based on that. During an email exchange I was made aware that they have recently been able to get the ARK Resister Bag. Yes, folks, you read it, the ARK resister bag is the exact same one used by the United States military for protecting electronics from moisture, EMP and more! Now, the size the bag comes in makes it perfect for storing a medium to a large laptop, handheld HAM radio, spare batteries, solar panel charger, and even a few external hard drives for additional information usage. Being the lifetime prepper and purveyor of the extremely intelligent 1 is none, 2 is 1 and 3 is a good start, I have since purchasing placed two systems for storage inside these bags. I will be getting several more bags and update a few caches and drops with them over the next month or so. Sealing them is relatively easy, you can seal them using heat OR you can do what I did, and roll the end up tight, like you would with a waterproof bag, fold it back and using my favorite gorilla duct tape wrap it three times minimum to ensure it stays closed. This will work quite well and will make it far easier to open for software updates (I update twice a month) and potential adding of additional parts and programs as needed. It is my strict opinion that this bag could potentially become the largest selling item CrossBreed has ever brought to market, and at $19 apiece (go through the link above if you have Amazon prime) there is absolutely NO reason to not have at least 2 or 3 of them for your most precious equipment, specifically your communications equipment. Now I am aware that there are several people who will extol the virtues of building your own inexpensive EMP protecting faraday cage, however, one thing I can virtually guarantee (and yes I have built a few myself) unless you also built a massive EMP device, how do you know it will work? A quick check via several easily available sources shows that this material has been tested thoroughly, to meet and exceed U.S. Military standards. So let’s go ahead and list the benefits and the drawbacks. Size, I fit a 15” GD6000 laptop (mil drop rated) with spare battery, three terrabyte hard drives (mil drop rated), one UV5r HAM radio with a spare battery, one 15-volt Solar panel for charging and charge controller as well. I had more than enough room for additional pieces and or materials and all of it was easily sealed up in a watertight roll approach. Cost, At this timeCrossBreed®, is the only manufacturer distributing the real deal made to meet and exceed military specifications. They are doing so at an extremely reasonable rate. Strength, I tested one in the extreme, loaded it with some similar objects and submitted it to minor drop testing and dragged it for a bit around the yard, it did not sustain any damage that would cause it to stop working well. I wouldn’t, of course, recommend dropping your electronics, however, I had to see how strong the material was. And it is extremely durable! Included with the bag, a sealed large desiccant package, and instructions on use! The overall benefit to modern woodsmen, preppers, and survivalists – Honestly, since communications is such a huge thing, I truly believe that having backups of your equipment inside of these bags stashed away from excess weathering will ensure the longevity of products involved. Spending hundreds of dollars on electronics for survival and NOT protecting them would be a greater issue in my strict opinion. The only one that I was able to find, I have not found one large enough for my 4runner yet. I will keep looking and until then, cross my fingers that I don’t need it too soon! As always, your comments and feedback is appreciated, please be sure to read the entire article as I try to include all applicable information within it. Understand that in most cases doing these reviews costs me time and money, unlike so many big time “YouTubers” and the like I am not paid a salary nor do I often receive free merchandise to test. Even if I do receive merchandise “gratis” I still present the facts and refuse to allow that to stop me from continuing with solid reviews meant for your benefit. I have always had extremely good business relations with them, as far back as 2006 when you could get Mark on the phone occasionally! Nowadays they have a superior staff with solid craftsmen who continue to do what they began, put together solid, well-formed, comfortable holsters and now offering the ARK bag as well. Thanks again for reading!